Story: Jack (Jackie Chan) is a renown archeologist who one day is visited by researcher Ashmita (Disha Patani). She has acquired a map which gives a hint on the whereabouts of an old family treasure which once was supposed to be given to China as a present in order to ask the country for help against a ruthless warlord in India. The treasure has become lost, though, and Jack finally has a new clue where he could find it. With the helping hand of his assistents Nuomin (Miya Muqi) and Xiaoguang (Zhang Yixing) he goes on a quest of finding the treasure, but first consults the tomb raider Jones (Aarif Lee), whose father has been after the treasure for a long time. However, you can't always be sure about his loyality. 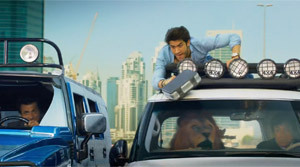 When Jack eventually has the key to the treasure in his hands the descendant of the warlord back then, Randall (Sonu Sood), turns up and snatches the important puzzle piece form the archeologist. A race against time and Randall commences, which leads the archeologists around the whole world. In the end, the contrahents finds themselves in India where the decisive showdown is about to take place. 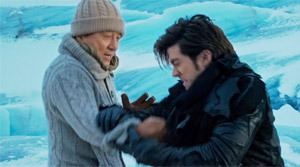 Review: Jackie Chan once more tries his hand at an action comedy in "Armour of God 2" style. That this is a questionable undertaking with 62 years should be obvious. Chan doesn't need to prove anything anymore, and let's be honest, he simply can't either after his countless bone fractures which were the price for bringing action cinema to the next level. Thus, the question pops up if a movie without Chan's death-defying stunts, but with the silliness of his 80s flicks actually works nowadays. The answer is not really surprising. 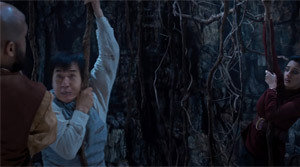 Chan should have left "Chinese Zodiac" the last of his adventure movies. There, we had the "Indiana Jones" feeling paired with Chan's slapstick and neat action - but on sort of a high-quality level. It should be obvious that the story is neglectable in a movie like this. The only problem is that there is so little to be found in this respect that it stands out too strong when random shifts from one location to the next occur, just to be able to present the next action scene. The editing isn't always very fortunate so that there are clearly empty spaces to be made out in the movie. Then there is also the supporting cast which consists of several women, among others Disha Patani or model Miya Muqi, who are only lightly dressed at all times, and are worst of all oftentimes shot in slow-motion in order to capture their breathtaking beauty, I assume. This only lowers the movie's already low standard more. Zhang Yixing, of Chinese-Korean boyband EXO, is supposedly eyecandy for female audiences. But they will have to wait for the ending to see him dance. A small gleam of hope concerning the cast is Aarif Lee ("Cold War 2") who manages to convince during the action scenes, but unfortunately doesn't get the attention he would have deserved as a half-rogue tomb raider. Jackie Chan still remains the focal point. And even though it certainly may be astonishing what Kung Fu he is able to showcase at his age you also can see that the pictures are played with double the speed. To be fair I shouldn't hide the fact that this is also the case in action scenes without him. 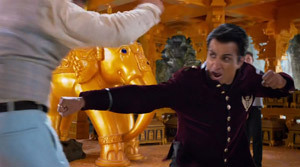 However, it needs to be pointed out that the action is the only reason that speaks in favor of "Kung Fu Yoga". The rest is at times outrageous. Unnecessary scenes of CGI-created animals (at least they look somewhat decent) and a Jackie Chan who more than anywhere else can't hide that he has become old during his humoristic moments. Let's get to the worst part, though: The story takes itself shockingly serious and is ridiculously educational. Nature and history belong to everyone and shouldn't be exploited for the personal gain of an inidividual. This surely may be true, but trying to convey this message in an action-slapstick film like "Kung Fu Yoga" with a serious face and at times even with pseudo-philosophical lines is absolutely unbefitting the movie. The picture seems to be swinging the moral hammer a lot in general without knowing what it wants to aim at. Director and writer Stanley Tong has already shot a movie with Chan in the shape of "Police Story 3: Supercop" and he would have done better remembering what he does best: Bringing to screen good action and sillines. The way it is "Kung Fu Yoga" simply seems too forced in its approach of educating us. And what's with the "Yoga" in the title? As if the filmmakers wanted to emphasize, no matter what, that this is intended to be a production aimed at Chinese and Indian audiences alike. 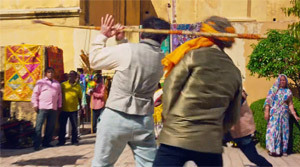 Accordingly, it's inevitable: As a homage to Bollywood productions there has to be dancing. Jackie Chan just seems to have waited for this and Farah Khan, a famous choreographer, so I've been told, has been brought on board for the necessary expertise. 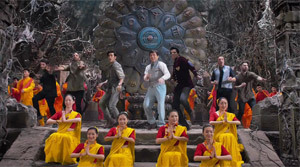 The song used is a remix of Chan's "Endloss Love" of the movie "The Myth", in which Chan played the archaeologist Jack, too, also with Stanley Tong sitting on the director's chair. Also, It's disappointing that particularly in a movie like this there aren't any bloopers feaured during the credits. The humor doesn't always score, there is no narrative structure and so only the action scenes can keep you afloat. 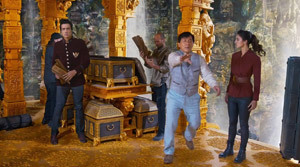 "Kung Fu Yoga" sometimes reminds us of Chan's slapstlick movies of old, which makes it even sadder that the movie can't even begin to hold a candle to those works.